Earlier this week, some photos had surfaced via Entertainment Weekly from the November-airing Riverdale episode “The Midnight Club” which, among other things, would feature the young actors from Riverdale playing their parents. Now, we have a full gallery courtesy of The CW. KJ Apa is Fred Andrews. Cole Sprouse is FP. Lili Reinhart is Alice Smith channeling her inner Shelly Johnson. Camila Mendes is Hermione Gomez. Ashleigh Murray is Sierra Samuels. Casey Cott is not-yet-Sheriff Tom Keller. Madelaine Petsch is Penelope. And… in a surprise that probably shouldn’t have been a surprise — Dead Jason Blossom, a.k.a. Trevor Stines, is playing his father Clifford! You can see the full gallery of 21 photos below. UPDATE: More photos from the flashback episode have been released! 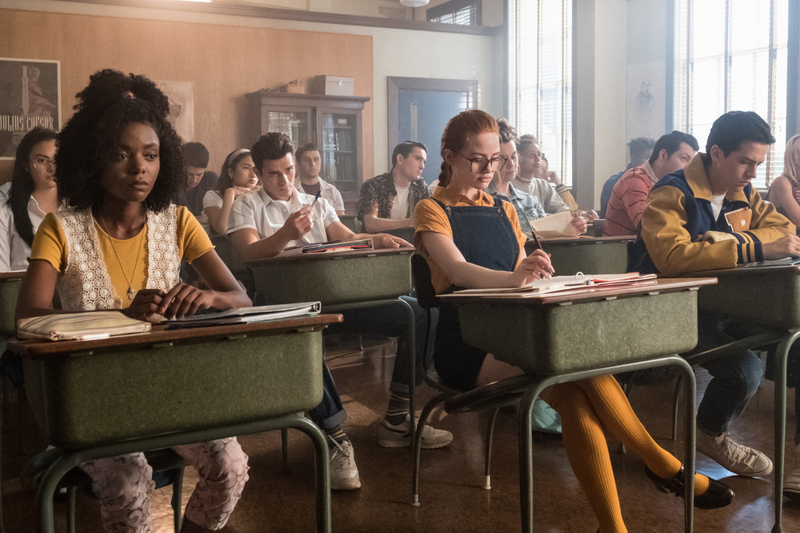 Riverdale -- "Chapter Thirty-Nine: The Midnight Club" -- Image Number: RVD304a_0076.jpg -- Pictured (L-R): Camila Mendes as Teen Hermione Gomez, Ashleigh Murray as Teen Sierra Samuels, KJ Apa as Teen Fred Andrews, Madelaine Petsch as Teen Penelope Blossom and Cole Sprouse as Teen FP Jones -- Photo: Katie Yu/The CW -- ÃÂ© 2018 The CW Network, LLC. All Rights Reserved.